Today is the start of our year-end posts. 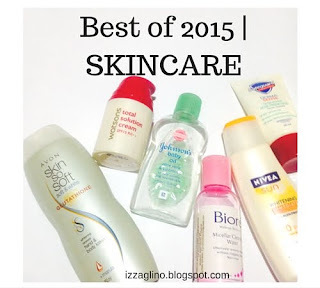 Just like what I did last year where I summarized the Best Products of 2014 in the categories of eyes, lips and face products. This year I will start off with skincare. 2015 has been a great year for me to check out and invest in products for the skin and so I wanted to list the items that brought miracle to my life. Again this will be a series so please do check out my blog for the next coming days. I haven't reviewed this lotion yet but I did buy this one on the month of September. Ever since I've been using this lotion and loving its effect on my skin. I never had any dry patches anymore plus its whitening benefit is really effective. I also love the fact that it's only 149pesos for 150ml which is very cheap compared to other whitening lotions. Etude House has never fail in their product presentation. I saw this in their counter and I immediately fell in love with the packaging. This is a great everyday cleanser and leaves you with a smooth squeaky clean face. Read HERE. This product is a eureka one for me. I bought it for 99pesos only and has been my everyday moisturizer. In 2015 I've witnessed the magic of Ponds Perfect Cold Creme. It's a gentle cleanser that gets the job done and brings me a beautiful radiant skin afterwards. I love the cooling effect upon application and how it easily melts down my makeup. Read HERE. Another makeup remover that I am glad I tried. It's worth the price as it lasts long, it effectively removes stubborn eye makeup plus it doesn't clog your pores. I love that I can just simply use a cotton swabs to take the makeup away. If I am too lazy to wash my face with water it doesn't matter because this makeup remover thoroughly cleans your face. Read HERE. I finally started wearing a sunscreen. I don't know why it took me this long to realize that I need some sun protection for my face but bringing this into my skin routine is super worth it. I felt so much difference in the condition of my skin. I can go to work even without foundation. I highly recommend this sunscreen to everyone. Read HERE. Himalaya Herbals is a brand that I am not that familiar with. I got their lip balm and was obsessed for a long time. Since the balm is soooo good I bought some more of their products including a Clay Mask and a Moisturizing Cream. Out of the two the Himalaya Herbals Moisturizing Cream is my favorite. It is a heavy moisturizer you can use at night and will make your skin more supple in the morning. Read HERE. I give the Soap of the Year award to this Belo Intensive Whitening Soap. It effectively whitens the skin and doesn't overdry. I love the smell though the price and longevity is and I finished about four bars of this soap in just 3 months. Read HERE. I count this as the best and the cheapest makeup remover ever. It help soothe and nourish skin while effectively removing the makeup. I can simply take off my makeup with one wipe. I love how it leave my skin without any makeup residue. The only downfall of this is that your skin will look and feel greasy so you have to still wash your face with water. Read HERE. 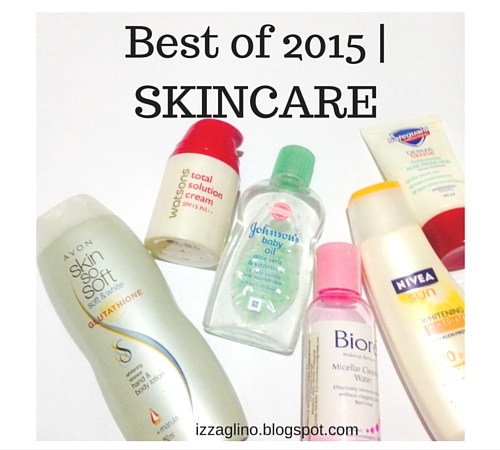 That's it for my Best of Skincare post. Tomorrow I'll be listing Best of 2015 | Face Products (Primer, Foundation, Concealer, Powder, Blush etc.). Hope you enjoyed this post.